A new photo released by NASA runs contrary to the commonly held belief that Mars is a "red planet". 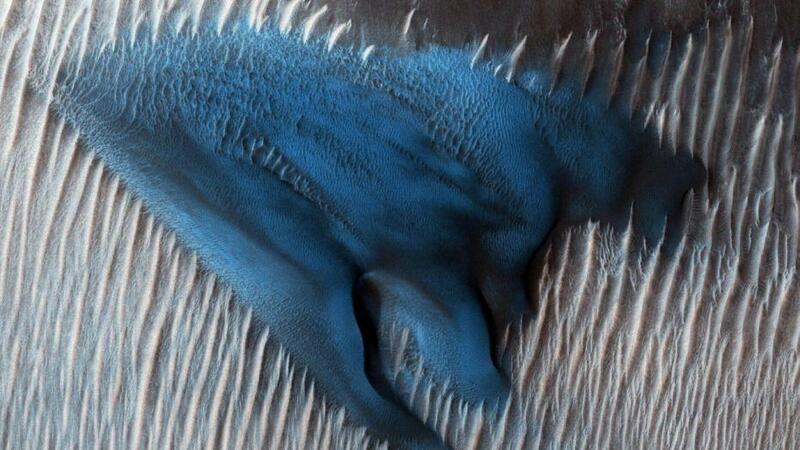 The image has the internet buzzing because it shows a sand dune on Mars' Lyot Crater region but instead of being red, the sand dune is blue. The Mars Reconnaissance Orbiter (MRO) took the image and NASA said it "shows a field of classic barchan dunes on Jan. 24, 2018." NASA's statement also said the image was taken using the MRO's HiRise camera. The statement issued by NASA also described the particular blue dune saying it "is made of finer material and/or has a different composition than the surrounding." The images are dramatic and continue to capture the public's imagination, especially since the planet is experiencing a massive dust storm that has put a damper on Mars operations. A composite selfie was released earlier this week taken by NASA's Curiosity rover created by scientist Sean Doran. NASA has called the massive planet-wide dust storms "unprecedented". The dust storm has caused havoc on Mars making the rover operations difficult, one of the rovers is so engulfed in the dust storm that is unable to charge its solar panels and has gone into hibernation. The Opportunity Rover will have to wait for the dust storm to subside before it will be able to charge its solar panels and resume operations. Like NASA has any credibility!